Wow, what a great weekend I just had, my gosh. Did you have a good weekend? I know, it’s already Tuesday but I feel like it’s Monday so bear with me. It all began on Friday morning when I boarded the train at Montreal Central Station headed for Kitchener, Ontario. It was a long trek, but totally worth it knowing that my blogging friend Angela was on the other end wait for me. Angela and I have been chatting for ages so to finally get the opportunity to hang out in person was a real treat. And let me tell you, she knows how to show a girl a good time! We began our weekend adventures with a visit to The Works on Friday night for burgers and salads. Of course I was the one that indulged in a big, juicy elk burger complete with a basket of sweet potato fries while Angela stayed healthy with a large chicken salad. We were so hungry by the time we were seated that neither of us took photos of our food. Massive foodie fail. We’re both early risers so we decided to head to the Athletic Center in Waterloo for an early morning intense hot yoga session, then a visit to Dana Shortt Gourment for some seriously amazing infused oils and vinegars, The Naked Sprout for lunch (best raw/vegan Caesar salad I’ve ever had in my life), Whole Foods Market for browsing, and Fresh Restaurant for dinner. We were both exhausted come 8pm that night. Sunday was a far more relaxing day filled with blogging, cooking, and chatting. Then on Monday, Angela invited me to her spin class at GoodLife Fitness. Everything was just awesome. Not only did I get to meet a wonderful new friend, I am now inspired to eat more vegetables. For serious, I’ve never seen someone eat as many vegetables as Angela does. She puts my produce consumption to shame. 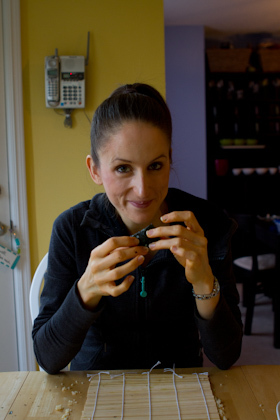 And it’s no surprise that; with Angela’s love for produce, we gravitated toward developing recipes using fresh, local and raw ingredients during our time together. 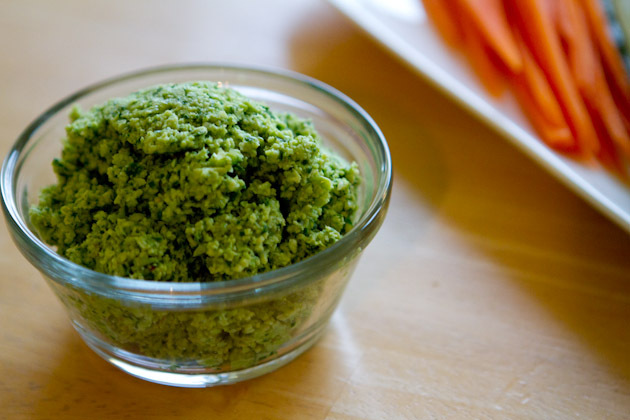 First up in our list of kitchen yummies was this edamame pate that we later used to stuff into grain-free California rolls. Oh this recipe’s a keeper! Earthy vegan pâté great as an accompaniment to veggies, cooked grains, crackers or used as a rice replacement in California rolls. Store in an air-tight container until ready to use. Will keep for 2-3 days. 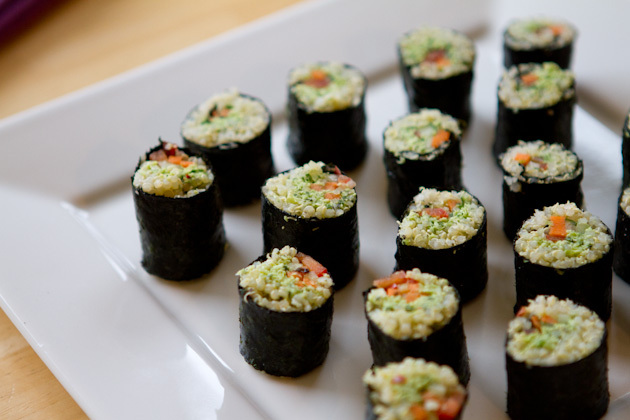 The original plan was to smear our pate alongside cooked quinoa for Quinoa California Rolls. We did it, and they were good, but we both liked the rolls SO much more with the quinoa omitted and just rolled in nori with loads of fresh veggies. 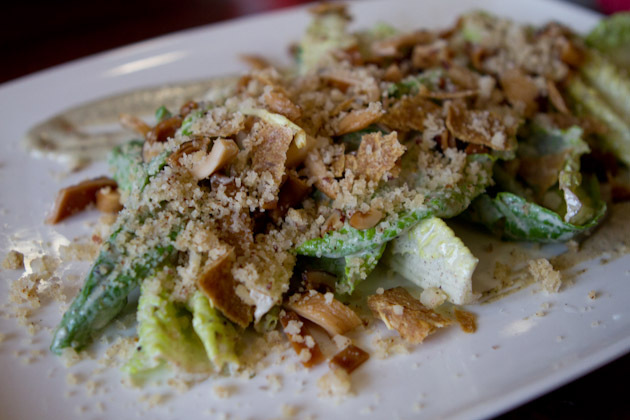 Any vegetables are fair game, as long as they’re sliced thin. We used carrots, red peppers and cucumber. 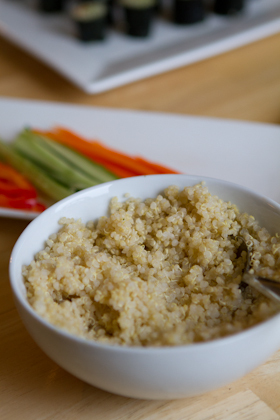 If you can’t live without the grains in your California rolls, but want to try something new and a bit healthier, there’s an easy way to prepare quinoa so that it’s perfect for your homemade California rolls. 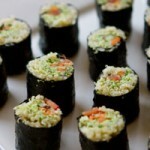 For California roll-ready quinoa, click here for the recipe and nutrition information. If this is all foreign to you and looks like a huge feat, do not fret. It’s easier than it looks. 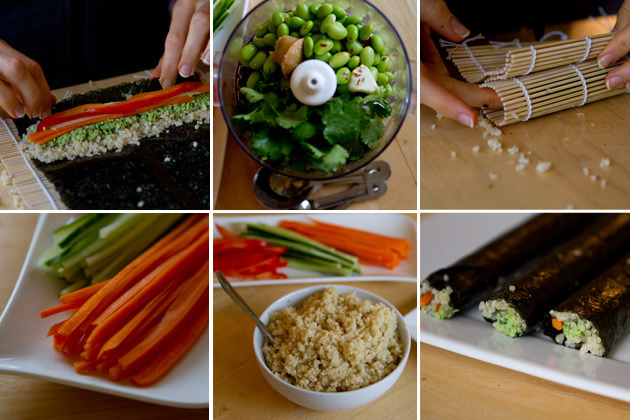 For step-by-step instructions on how to assemble homemade vegan California rolls, check this out. And that’s just the beginning. We made and consumed so much healthy, delicious food, side by side and really inspired each other to step out of our culinary comfort zones. It was a weekend I’ll always remember! 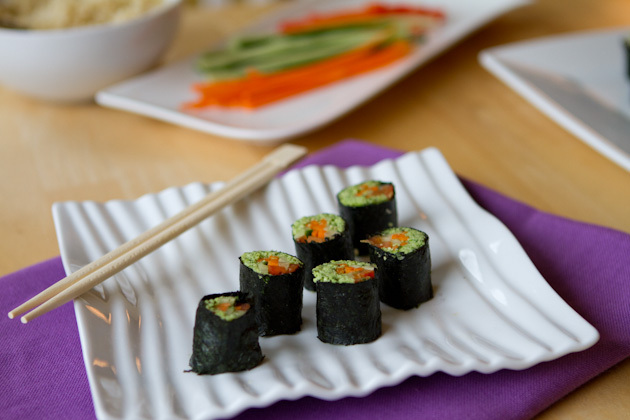 What’s your favorite filling for California rolls, homemade or restaurant created?